I also offer workshops and cooking classes for private groups, which are full of information and insights with plenty of tips on how to individualize it all to support your unique journey. Workshops I’ve offered in the past include: Intro to Ayurveda Nutrition, Creative Cooking for You, Enlighten Your Digestive Fire, and Food and the Mind & Spirit. If you are interested in organizing a workshop in your community or hosting a cooking class in or around Spokane, WA, contact me here. A cleansing and detoxifying regimen of eating only Kitchardi (a tasty soup made with mung beans and rice) for one week has been used for thousands of years to purify the body of toxins that accumulate as a result of improper diet, stress and environmental pollutants. Through this Kitchardi fast, it is possible to eliminate excess body weight and ease various digestive ailments such as gastric distress, constipation, headaches, joint inflammation, skin problems, irritability and fatigue. Many people find that this cleanse also helps them regain a healthy relationship with food and to extinguish cravings. Group Sessions – $115. Includes all group sessions, shared meals and materials (instructions for self-cleanse and a list of ingredients to administer the cleanse). Sessions and Cleanse Kit – $ 195. Includes group sessions, shared meals, materials, and cleanse kit with all ingredients to administer the cleanse. Sessions, Kit and Fully Prepared Meals– $285. 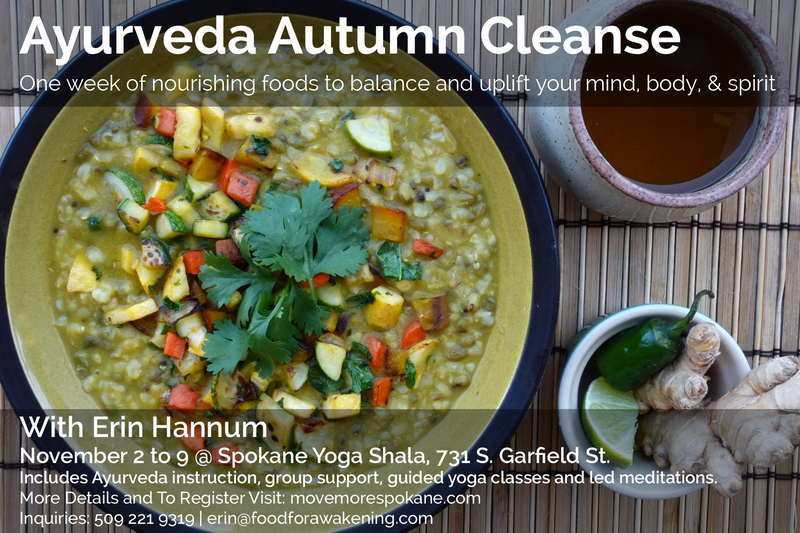 Includes all group sessions, shared meals, materials, cleanse kit, and Kitchardi prepared daily (pick up at studio). You can register online here via PayPal. For more information or to make arrangements to pay by cash or check contact me here. I can also guide you through a private Ayurveda Cleanse (panchakarma) wherever you are in the world. I will provide materials which includes instructions for self-cleanse and a list of ingredients to administer the cleanse. This also includes a private consultation via Skype (or in person if local). For more information contact me here.